This is an international, all-media, juried art exhibition on view May 6 through May 22, 2006 at Gallery Lombardi in Austin, Texas and online for at least one year at www.deathpenaltyartshow.org. Artwork must address the issue of the death penalty. Purpose of the juried art show is to foster the creation of new artwork on the death penalty, to celebrate artwork that may already have been created and to encourage and enhance civic engagement and dialogue about the death penalty. We welcome submissions from artists who engage the issue from any and all viewpoints. JURORS are Annette Carlozzi, Curator of American and Contemporary Art at the Jack S. Blanton Museum of Art at The University of Texas at Austin; Lora Reynolds, owner of Lora Reynolds Gallery in Austin. Lora Reynolds Gallery presents contemporary art in all mediums by established and emerging, national and international artists; and Malaquias Montoya, an artist and professor of art at the University of California, Davis. For an easy online entry form please visit the website or contact the organizers by email. Work in all media is eligible. Prizes totaling $1,300 including $500 for Best in Show. Two-dimensional work must be suitable for installation, ready to hang and must not exceed 84” in any dimension. Sculpture should not exceed 84” including base, and must be light enough for two people to handle. Videos/DVDs must be no longer than 15 minutes. Fees: Up to 3 slides/JPGs/photographs/videos = $15/artist. Additional slides/JPGs/photographs/videos = $5 each. 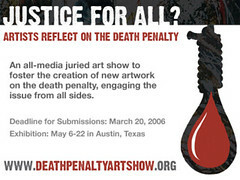 For more information, contact: Scott Cobb at 512-302-6715 or Email: info@deathpenaltyartshow.org.